Have you had a chance to make my Moroccan spice blend yet? 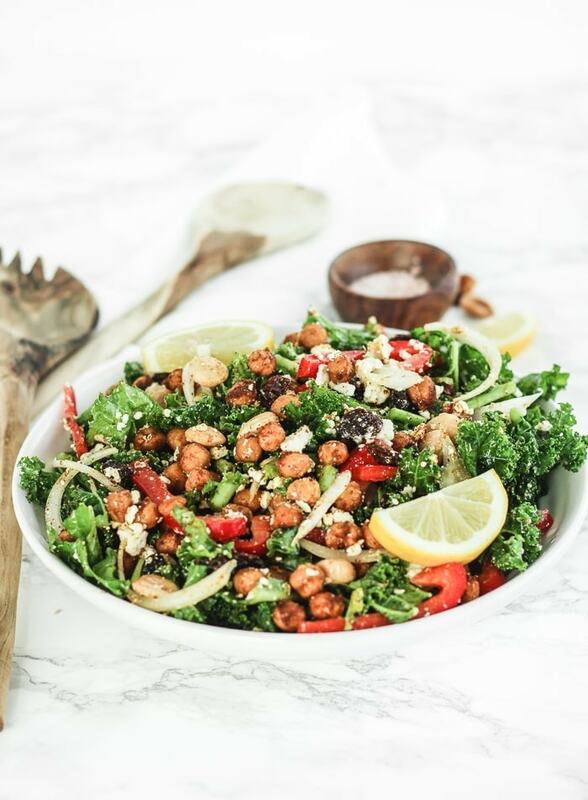 If not, you have a great reason to try it – this delicious Moroccan chickpea kale salad! Once you make up the easy spice blend (just 4 ingredients! ), you are just 20 minutes away from a super flavorful, nutrition-packed salad that will blow your taste buds. And you also get to use the seasoning on everything else going forward, so it’s a double win! The sweet and spicy blend of nutritious ingredients in this salad is to die for. Moroccan roasted chickpeas are the star, and they go beautifully with the subtle sweetness of raisins and bell pepper. Add some crunchy almonds, savory feta and a hint of lemon juice, and you’ve got one tasty, nutritious salad! 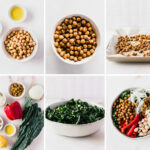 While meatless, this delicious Moroccan chickpea kale salad is hearty enough to be a main dish. It’s full of plant protein from chickpeas, almonds and feta (which is technically not a plant protein, but it does add a lot of flavor and a little heft! But it can also be left out if you’re vegan or dairy-free). It is also loaded with fiber, so it’s extra filling. You can eat it for a meatless main dish, or serve it with the protein of your choice for a balanced meal. What I love about this salad is that it’s also great for meal prep. Kale holds up nicely for a few days in the refrigerator, so you can portion this salad into containers to take to work. The flavors blend even more as the salad sits in the fridge, and you don’t have to worry about wilted greens. 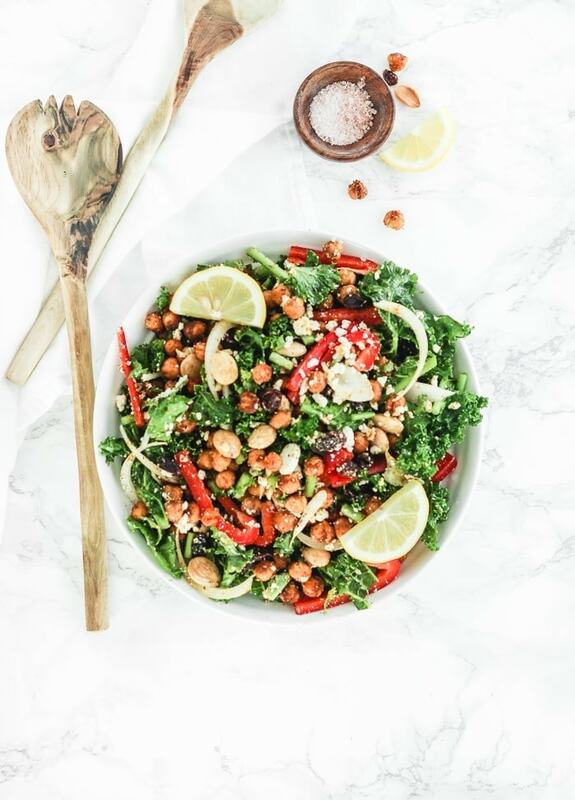 If you’re looking to step up your salad game, try this Moroccan chickpea kale salad! It’s a fantastic change-up from regular old greens and raw veggies. Enjoy! Heat oven to 400°F. Line a baking sheet with parchment or a silicone baking mat. Use paper towels to get chickpeas as dry as you can. Add to a bowl with 1 tbsp of olive oil and Moroccan seasoning. Toss well to coat. Spread chickpeas on prepare baking sheet. Roast 15 minutes. Place chopped kale in a large bowl. Add remaining 1 tbsp olive oil, lemon juice, salt and pepper. Gently message oil and lemon into kale. Add onion, bell pepper, almonds, raisins and feta to kale. Once chickpeas are done, add them to the salad. Toss to coat.